When a department requires items from Bulk Stores, a reservation for goods will be placed on the system. This will inform Bulk Stores of the department’s requirements. Bulk Stores can then act upon the request and provide the goods to the requesting department. The requesting department will distinguish whether the goods are for stock in their stores or for immediate use by entering in a movement code that tells the system which way to process the request. Also if the goods are for immediate use then the requesting department will need to specify how the goods will be charged (i.e. by cost centre, project, or statistical internal order code). If the user orders Zero-rated items then the end of the script will explain how to generate a certificate to be forwarded to Bulk Stores. 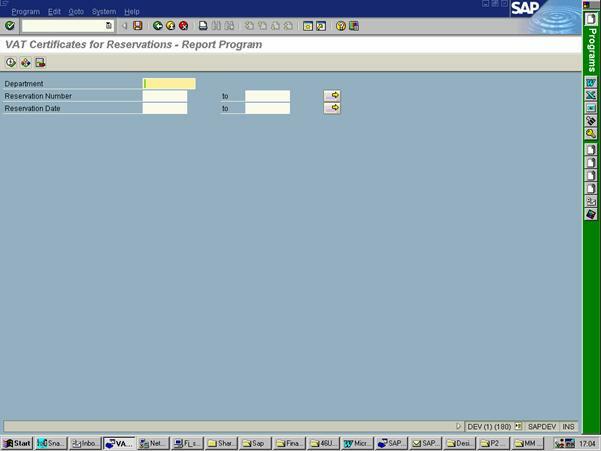 This document will take you through the core processes required to create a reservation by following steps 1.1 through 1.4. 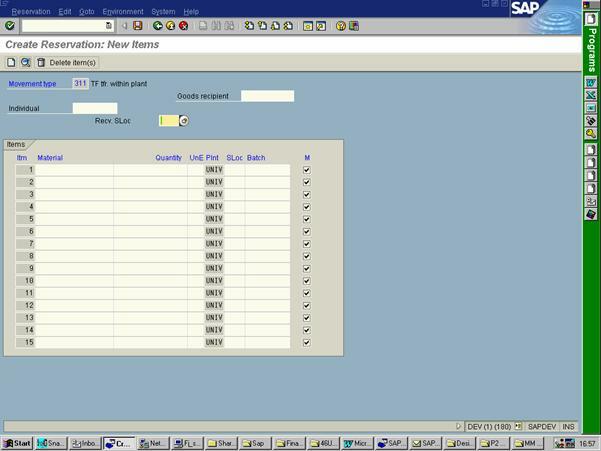 2.2 Display a Reservation to Bulk Stores for an item with standard rate VAT. The above movement codes can be split into two classifications – the ‘2’ number range which are for immediate use and thus charging (consumption), and the ‘3’ number range which are for transfer from Bulk Stores into departmental stores. The differences between cost object (cost centre, project, order) will have been explained during your training, but for further information contact Central Finance. Plant This is a code representing the university and is defined at (UNIV). Recv. Sloc. The identifier of the receiving storage location when a transfer movement is applied. is a code representing the university and is defined as (UNIV). Enter the above data. Dependent on the type of movement code entered you will now be taken to one of two screen layouts. A consumption movement type will give you screen A below. A transfer movement type will give you screen B below. code for a cost centre, project or order. Enter the data as required. Remember that the line items you enter must relate to the movement type entered and must be chargeable to the cost object or be deliverable to the receiving storage location indicated in the header of the document. Note: a separate reservation will be required for each movement type and charge code/receiving store. 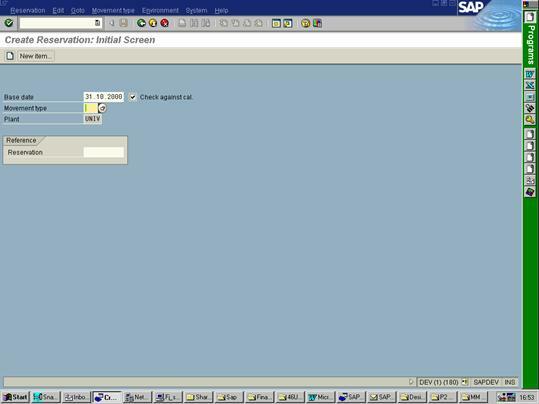 Click on the ‘Enter’ button to validate the screen and then click on the ‘Save’ button to save the reservation. If you place reservations for zero-rated VAT items, periodically you will need to generate the Zero-VAT Certificates. To do this proceed as follows. Follow the path or enter the transaction code for generating the certificates as indicated under 1.2 above. 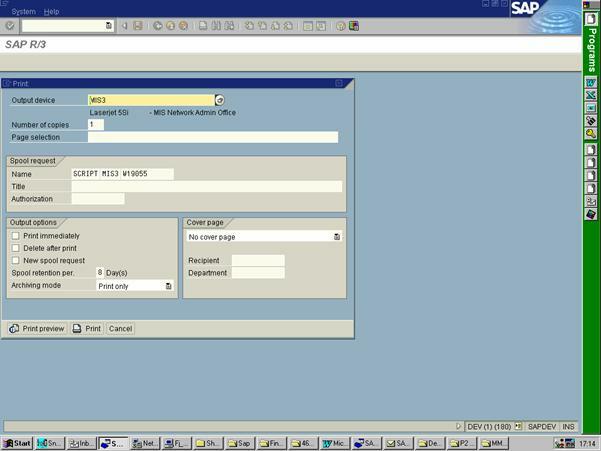 Enter in the data required as specified above and then click on the ‘Execute’button to generate the certificates. Ensure that the ‘Print immediately’ box is checked and then click on the ‘Print’ button to send the certificate to the printer. · A Equipment Zero VAT certificate. attached to the material master record number, e.g. relevant items between the two types. Click on the ‘Exit’ button to leave this area. Select the required Movement Type. Enter. Select the material and enter the quantity. Enter a Unit of Measure of each. item with standard rate VAT. Enter the Reservation Document Number. Change the quantity of items reserved. Note: No other information on the reservation may be changed. 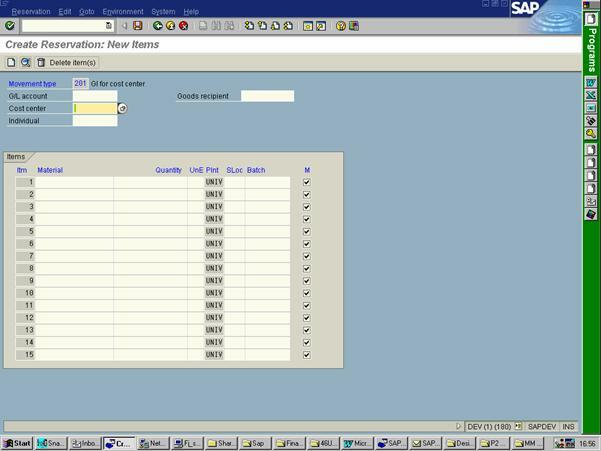 Select the required account codes and individual. Select the material with the material code ending in ‘XC’ or ‘XE’. These codes indicate that the material is either a consumables item or an equipment item that is zero-rated for VAT. Enter the Purchasing Group (in upper case) in the Department’ field and/or Reservation/s and or Reservation Date/s to default into the zero-rated VAT certificate the required reservation items. The print box will appear with the default printer. Indicate that Print immediately is required. Print preview to check entries and then print.